What to expect from my stories. A good read, a fun read—that’s what you’ll get from my Gerhard and Wolf Adventure Mysteries. There’ll be something of interest on EVERY page. That’s my promise. If I don’t like it when I write it, I delete it and start again. You get the best. The unexpected, the unusual, are blended with real world situations that could happen to anyone, all set in intriguing locales and written to move along with dispatch. And there’s humor. Sophisticated readers expect it, but be alert, because the funny stuff is seldom obvious. I enjoy tucking it away within the sentence so it pops out with little warning. And when you find one, and chuckle, think of me. I’ll be watching and smiling from between the words. How Did He Know? Now Available! Gerhard’s magnificent scheme to pilfer five sacks of Amsterdam diamonds, then lift two priceless Gutenberg Bibles from a German museum, upset the ingenious frozen pea strategy of two retired Detroit school teachers with the same idea. But in the end, which thief out-thieved the other? 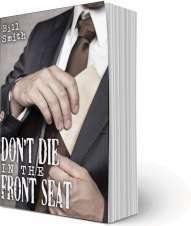 Don’t Die In The Front Seat Now Available! He really didn’t want to get on that bus in the first place. The conductor on the train that pulled Gerhard’s private railcar told him it was the only way he could get to Frankfurt, now that the railroad strike started. But there wasn’t any reason for a strike and the bus didn’t just happen along. It was all created. Someone wanted Gerhard badly enough to cause the railroad to shut down and get him on that bus. Ancient books in a monastery — a code hidden by soldiers — a deep fjord — and a mysterious stainless steel cylinder — all lead to a fantastic war-time discovery. 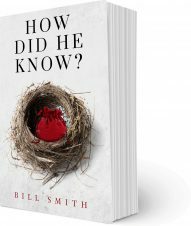 Bill Smith’s debut novel is a thrilling ride of intrigue that pulls the reader into the darkest secrets of history. 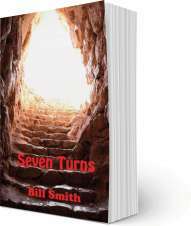 With a surprise at every turn, Smith’s action-packed Seven Turns leads us to question what is imagination and what is real.